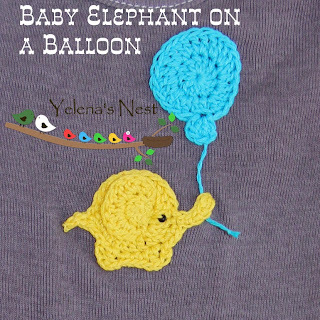 Here is a crochet applique of a sweet baby elephant hanging onto a balloon. but if you do, I ask that you give me credit. I have created these patterns myself. Please do not copy and claim them as your own. Please do not re-publish photos as your own. When joining rnds, do not sl st into top of chs, sl st into the first st.
Rnd 1. 12 dc into ring, join with a sl st to 1st dc (13 dc) Tighten ring. Rnd 3. (Tail) Ch 4, sl st in 2nd ch from hook, sc next ch, hdc next ch, sk 1 st, sl st next 2 sts, (back leg) ch 4, dc next st, ch 1, sc next 3 sts, (front leg) ch 1, dc next st, ch 2, sl st next st, sc next 2 sts, (trunk) ch 6, hdc in 2nd ch from hook, sc next 4 chs, sl st next st. Tie off. Row 1. 6 dc, do not join with a sl st, turn. Row 2. Ch 1, hdc in same st, 2 dc in next 4 sts, hdc and sc in next st. Tie off and weave in all tails. 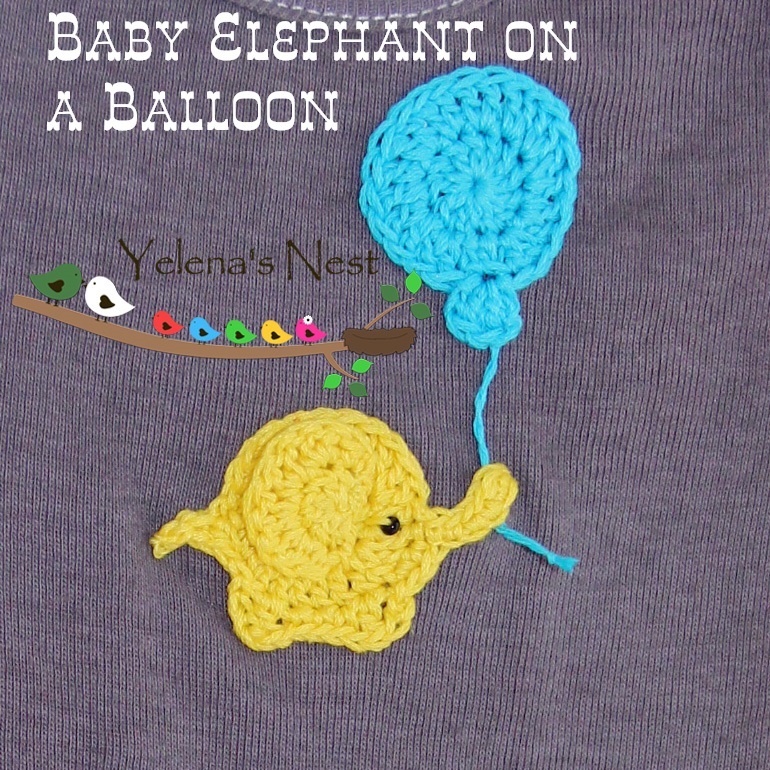 Sew ear onto elephant as you see on photo, embroider an eye with black thread, or sew on a black bead. Rnd 1. 12 dc, join with a sl st to 1st dc (13 dc) Tighten ring. Rnd 3. Ch 3, 3 dc into same st. Tie off and weave in all tails. That sounds wonderful! Have fun!